So Jezebel released some images last night that we're thinking may shock a few people. 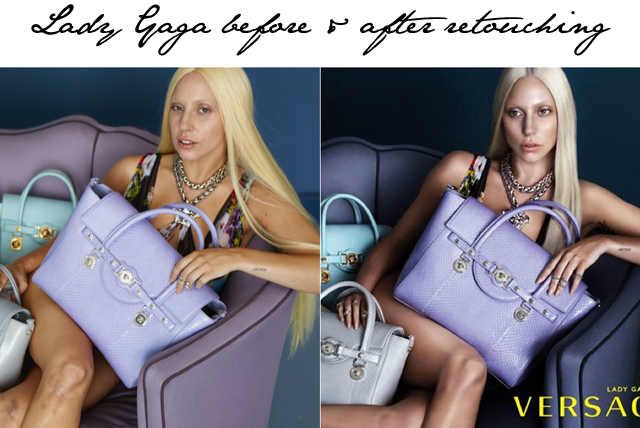 Lady Gaga's unretouched Versace campaign images have been shared for the whole world to see. And here's why we think she won't be upset. Lady Gaga has never been one to shy away from reality. She was sharing makeup-free selfies long before it became cool and her fans embraced her and continue to love her for it. These images from Versace are no different. If anything, this just goes to show the world just how much work goes into "perfecting" images before they are put out for the public to digest. It's becoming a real art form these days, repainting people for their campaign debuts. High fashion is fantasy and Versace are just continuing in the path laid down by the industry since the invention of filters on cameras. So while many will look at these photos and get upset and claim they are lied to in advertising, just accept that the fact of the matter is that everything is photoshopped. We are no longer living in an environment where we look at pictures in magazines and believe that people really look like that. It's the dawning of a new day.